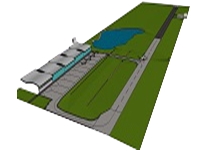 The New Bohol Airport Project of the Department of Transportation in Panglao Island involves civil and utilities construction for the airport infrastructure, which includes a 2-km runway, taxiway, apron and access road; as well as airport buildings and facilities such as passenger terminal building, control tower, administration building, powerhouse, maintenance and fire station building, sewage treatment plant, pumphouse and other ancillary structures. The construction of the Project commenced last June 2015, and once completed, will replace the existing Tagbilaran airport. 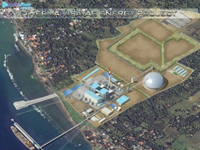 Therma Visayas Energy Project in Toledo, Cebu is for the installation of 2 units of 150MW Coal-fired Power Plant for Aboitiz Power. EEI will be doing the building works package and mechanical works package 2. Construction began last September 2015 and will be completed on September 2017. The interim runway extension of the Caticlan airport is located in Barangay Caticlan, Malay, Aklan. This project is owned by Transaire Development Holdings Corporation, the Infrastructure group of San Miguel Corporation. The Caticlan Airport expansion is a design and build project extending the runway to 1,800 m consisting of 90m west side extension and 60m east side extension. This Project also includes an additional 250 x 45m runway extension and widening of 450m extension from 30m to 45m, the rehabilitation of concrete pavement, taxiway with 365m L x 25m W and 374m L x 25m W and the apron of 405m by 95m wide.